We are living in a world where we encounter many different situations, situations to which we must react. We see sorrow and grief in those around us; we respond sometimes with sympathy, sometimes with pity, and sometimes with sheer indifference. We see friends and family or strangers beset with difficulties and problems; sometimes we try to help, but at other times we turn away and justify ourselves by saying that it is not our concern. We see men and women who are rejected by others for some reason; sometimes we are willing to defend such a one, but at other times we feel it is more prudent to go along with the wider group. These are choices we all have to make, for we live in human society, in a community where the lives of others will somehow touch us. It would, of course, be wonderful if there were no sorrow or suffering, no pain, no hardship, no worries. It would be wonderful if no one were ever in the position of being judged by others and where we, therefore, did not have to make any decision on how to act. This, however, is not the case. We will never be free from making decisions on how to act towards those around us. We live in the world and we must, therefore, interact with the world and our fellow human beings. For many, this does not present a problem. Many people are content to act according to what is best for their own selves, and in so doing they feel that they are perfectly justified. Why, indeed, should anyone be concerned for those around him? Why not look out for our own interests and let everyone else do the same? This is an easy answer, but the Christian must bear something else in mind, something far more important than his or her own good and well-being. The Christian has been given a very unique and powerful example of what his life must be. 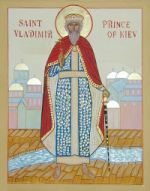 One of the central tenets of the Orthodox Christian faith is that God became man in the person of our Lord Jesus Christ. He lived on earth among us; He experienced our life in all its joys, sorrows, woes and worries; He saw human suffering and grief, and he reacted to them. He did not turn away from them; Ge did not pretend that it was not His affair or concern. Time and time again the Gospels tells us that Christ had compassion. Compassion and sympathy — the two words mean exactly the same thing: the ability to feel for someone else, the willingness to experience the worries and woes of our fellow human beings, the love which will enable one to reach out to the sorrows and pains of others and to extend to them the healing power which our Lord has entrusted to us. Our Lord dealt with the world in compassion and love, and He expects us to do the same. We have been redeemed by Him, baptized into his Body, and He expects us to carry on His mission and work in the world. Every Christian, be he Orthodox or otherwise, must ask himself or herself this question: Does my life reflect the life of Christ? Do my attitudes show the love and compassion which He had for human beings? Am I willing to take upon myself the responsibility of raising up those who are down-trodden or afflicted? Have I enough love in my heart to care for those whom society rejects? We would all like to answer, “Yes” to such questions, and possibly we would so answer without thinking. But stop and consider: Can we claim that we are always compassionate and caring? Can we truly say that we never turn our backs on anyone in pain or trouble, anyone who is suffering, anyone who is crying out for understanding and compassion? If we think long enough, we will probably all realize that we have not always been as Christ-like as our Lord expects us to be. Of course, we can always find excuses for our actions. We can always find a reason why we should not behave lovingly towards someone. We can so quickly see that some particular person does not deserve our concern. We know that God would not want us to have anything to do with “those sinners” or with “that kind of people.” In other words, we find it so easy to judge! This is the terrible trap in to which every Christian can so easily fall, and many do, and they can feel so righteous when they do so. But how can this happen? It can happen all to easily through our own consciousness of who we are. As Christians we like to think that we are “good people,” and when we see ourselves as “good people,” we immediately contrast others with ourselves. Then, since it is easier to see their faults rather than our own, we judge them, condemn them, and feel justified in doing so. As a result we create our own laws of right and wrong, good and bad, respectability and non-respectability. We feel that we are doing the right thing by rejecting those who do not measure up to our standards of goodness. The Christian is expected to live the full life of Christ into whom he or she was baptized. There can be no half-way Christian life. It must be the fullness and totality of what our Lord would have us to be, and then it will be fullness and totality of the joy and peace which only He can give. To be a Christian in the modern world is a challenge, and it will become more of a challenge as things change, grow and develop. The future may bring some radical changes to our society and our world, and we may have to meet those changes with solutions and answers which are equally radical. But the Orthodox faith, with its Tradition enlivened by the power of the Holy Spirit, is well equipped to face the future. We need remember but one thing: as followers of the Christ, the Incarnate Son of God, we are given the responsibility and privilege of living His life to the fullest. We muse show ourselves to be His servants and His presence in a world which is estranged from Him, and we must work and pray that through our efforts our Lord will be able to make that world one with His eternal Kingdom.